I have a 4870x2 and I can't get it to boot for the life of me. I can flash it, win7 detects it but still get black screen on boot. Hey there everyone! Thanks for your awesome posts, I'm actually newbie to all this so it was мун helpful for me to read posts from this thread! Have a great day! Having issues issues here too. Please read my thread and help if u know something! you can force flash, but the bios is corrupted now. so it might take several attempt to fix it, but not likely. if you didn't change it, then you must have downloaded the wrong one. atiflash won't change id, in less you know the command. I had the same problem with the mismatch bios in DOS. And everything will be just fine with the new(old)bios . No more mismatch SSID. The problem was that you must unlock rom first then flash the new one! I was having the same problem, I'll try this now. I need some help flashing the BIOS on my r9 290. I was able to get it on the USB, but when i run the scrypt "atwin~1.exe -f -p 0 r9290.rom". I get a message saying "This program cannot be run in DOS mode." Is there anything I can do to bypass this? Hey, I need some help flashing the BIOS on my r9 290. I was able to get it on the USB, but when i run the scrypt "atwin~1.exe -f -p 0 r9290.rom". I get a message saying "This program cannot be run in DOS mode." Is there anything I can do to bypass this? use ATIwinflash. I flashed 2 7950 cards with it over 20 times and never had an issue, but it's at your risk of course. I tried using ATIflash and ATIwinflash. I think the main issue is that system can't find my adapter. Whenever I run atiflash -i or atwin~1 -i, it says "Adapter not found". Is there anything that I am doing wrong? I have the exe and rom file in the flash drive. Whenever I run atiflash -i or atwin~1 -i, it says "Adapter not found"
ARCTIC Accelero Xtreme III on my r9 290 since it was overheating. But, since i have installed the artic accelero 3 I have not been able to boot my windows up. I see the initial logo and then a black screen. So, I though it might be the BIOS, so that why I was trying to flash them. It is a dvi adapter and I can't get into windows so I cant use GUI version of flash the card BIOS. OIC. I don't think there would suddenly be an issue with the BIOS from installing a new cooler. It's more likely (sorry to say) something has gone wrong during the install. Can you see the card in the mobo BIOS screen? Have you got a CPU with a built in GPU or a spare GPU, so you can boot into windows (with the R9 installed too) and investigate from there? Edit: Test the vga card with new cooler fitted in another System if possible; if same reseat the new cooler test again. Edit: Once Arctic X-III is removed for reseating; double check the vga cards PCB for damaged components; [use a magnifying glass] fingers crossed all is well. Edit: Looking at that cooler is all the weight being supported on the PCB maybe worth seeing if the vga card is seated firmly in PCIe x16 slot or if vga PCB has drooped. Yeah, thats what i am going to try. I will let you know how it goes, thanks for the advice. 1. What means: "except for Theater in bytes" ? 3. ROM ? Is ROM flashable ? Check out his great video on the procedure. After attempts to make a bootable DVD-RW and a bootable USB flash drive, I eventually made a bootable CD-R in order to flash the card. Everything went fine until the booting from the CD began. NWCDEX.EXE Version 2.81 CD-ROM file handler. Copyright (c) 1988,1998 Caldera, Inc. All rights reserved. At this point, I waited (due to typing was giving no response), restarted my PC and now my PS/2 keyboard won't work unfortunately I don't have a second PS/2 keyboard to test if it is my PS/2 port or the keyboard itself. Unfortunately I have a USB keyboard which isn't enabled in BIOS, so won't work until windows loads meaning I can't get back into BIOS. Is there anyway to fix the MSCD001 problem and partition D not installing, and does anyone know if the keyboard breaking is down to being in MS-DOS, or just the worst luck in the world? I had the same MSC driver error but I fixed it! I changed the Sata to IDE and IDE legacy in the BIOS and flashed it from the CD I burned. So I used - E:\ then atiflash -p 0 hv2.rom and it successfully did the job, it said it successfully flashed the BIOS and to restart to apply it. I have 2 MSI r9 290x gaming cards with different BIOS's and I tried to make them have the same BIOS but should never have used winflash. After sending one back for a slow fan I got sent back a 290x with PCB version 2.0. All is good now and it's using the original BIOS. I tried it because I couldn't control my #1 GPU's fan in MSI Afterburner on Catalyst 14.4 and they get hot and I need it to go sooner to 100% fan and I can't even do anything in Overdrive as it's broken. Turns out it might be a driver issue as AMD showed me how to fix it but the fan only works right on 14.9 but on 14.9 Mantle is crap it stutters for me. When I had 2 the same cards both version 1.0 the fan controller always worked on both cards perfectly. Now GPU #1 is shown in RPM and GPU #2 is a percentage and the fan profile on GPU 1 isn't as high as it's not using the MSI Afterburner curve of GPU #2. 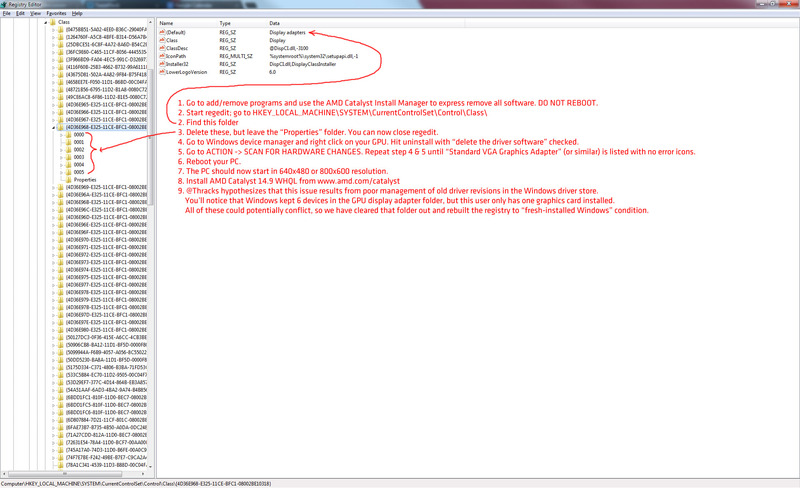 It works right if I install WDDM1.3 driver but it breaks when Catalyst is installed lol. If I apply the WDDM driver after Catalyst it removes Mantle completely so I don't apply it at all. Here is the fix that AMD recommended I do to get the fan control back but only works on 14.9 but they said to give them a few days and they should have 14.4 going. When I go about it, I keep getting this "Warning: cannot open swap file c:\cwsdpmi.swp" line as seen in the attached image. That and it can't seem to *find* the BIOS files but they're right there in the directory! Did I do something wrong? Attempted re-flash is on a Gigabyte GV-R7750C-1GI. shouldn't the code be something similar to. I created the CD with bios and ariflash.exe and the USB with Atiflash , Bios and winboot98. I pointed to the CD not the USB think of A as the CD. I followed the steps in the video I posted but instead of pointing to the USB like he does I pointed to the ATIflash.exe and Bios on the CD. Use the directory on the CD-r you made containing the bios. I posted this after I successfully did it. "I had the same MSC driver error but I fixed it! So I used - E:\>atiflash -p 0 hv2.rom and it successfully did the job, it said it successfully flashed the BIOS and to restart to apply it." I have since updated to Catalyst 14.9.1 and been running BF4 on the bios in crossfire brilliantly no issues at all. you typed the number 1 in the code meaning the second PCIe slot not the first. The first slot is number 0 such as atiflash -p 0 hv2.rom including the rom file. When you create the disk only put one BIOS with the ATIFLASH.exe file in there I see multiple rom files (BIOS's). I flashed mine with the boot disk I created on a CD-r I don't even know if the USB bootdisk did anything but it was there and it initialised but I pointed to the CD-r instead and flashed it off that. It is, all I did was just rename the atiflash-4.17.exe to a shorter file name: ati4.exe and atiflash.exe (atiflash_389) to ati3 in any case I needed to use an older version because the newer version didn't work. I am using another computer that has IGP as the origin PC this 7750 was in doesn't even have any IGP whatsoever. In the video, he used the CD method, I used the USB method. Also, for some odd reason when I do get around trying the CD version, thinking maybe the USB method doesn't work, my USB keyboard doesn't work! It works when I am using the USB method but CD method the keyboard is completely useless - no response! Which means I can't type anything! And yes I have legacy USB enabled, why else would it work under the USB method? Also the computer I am using to flash this on doesn't have any PS/2 ports....so I can't use a USB to PS/2 adaptor. However the PC of origin that this card came out of *does* have PS/2 ports, namely both mouse and keyboard, *but* doesn't have IGP that I can use as the card is bricked until I somehow re-flash the BIOS to make the card work again. I thought 1 was ur first PCIe slot? IGP is 0, first slot is 1, second slot is 2 and so on at least that's what he said in the video.... nevertheless, I did try both anyways but to no avail. 2. create a bootable usb disk using the "freedos"